Regional and global cooperation can open new doors for the Islamic finance sector and we cannot hope for a new growth paradigm while maintaining the status quo, said Rasheed Mohammed Al Maraj, Governor, Central Bank of Bahrain. The 25th anniversary edition of WIBC kicked off today under the patronage of HRH Prince Khalifa Bin Salman Al Khalifa, the Prime Minister of Bahrain, at the ART Rotana Hotel, Amwaj Islands, Bahrain. Convened by Middle East Global Advisors, a leading financial intelligence platform facilitating the development of knowledge-based economies in the MENASEA markets and in strategic partnership with the Central Bank of Bahrain, the forum is spurring a series of discussions focusing on “Islamic Finance & Sustainable Economic Growth in the Age of Disruption”, a theme that resonates with the conference’s steady vision to serve as a definitive check point for the global Islamic finance and banking industry. 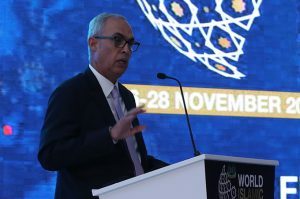 Showcasing his support for Islamic finance entities to thrive and grow globally and stressing on the way forward for the industry, Al Maraj said: “Islamic finance has followed a fragmented growth pattern since the start with various countries in the Middle East and South East Asia taking the lead. These country specific models have achieved reasonable success as measured by the share of Islamic finance in the respective markets. “Shari’ah standards, accounting standards, prudential standards and best market practices, all need to be developed for the Islamic finance industry with the global audience in mind. AAOIFI has been doing excellent work on Shari’ah and accounting standards while Islamic Financial Services Board (IFSB) has developed risk management and capital adequacy standards which conform to global best practices. International Islamic Financial Market (IIFM) has made valuable contribution towards standardizing money and capital market contracts as well as financing contracts. The recent endorsement by the IMF of the IFSB’s proposed core principles for Islamic finance regulation and their assessment methodology for financial sector assessments is a great news for the global acceptance of Islamic finance. What we need now is to convince regulators and market players to adopt AAOIFI, IFSB and IIFM standards in their respective markets”, added Maraj stressing on the need for standardization to enable global growth. The conference also played host to an exclusive interview of Khalid Al Rumaihi, chief executive, Bahrain Economic Development Board, which focused on emerging projects and financing, the value added tax which will be implemented in the Kingdom in addition to the benefits and risks of digitization. Al Rumaihi discussed the government’s integral role in supporting the continuous development of the local economy; encouraging constant collaboration between the public and private sectors, as well as creating an ecosystem that is conducive to the success of startups and entrepreneurs, in order to ensure the Kingdom maintains its lead at the forefront of its competitors in digital transformation across industries. Al Rumaihi also mentioned the key milestones achieved by the GCC countries during the past three decades, and how they have employed the bilateral cooperation as a factor to promote brotherly countries and unite efforts to succeed in the initiatives and plans set in this regard.